The Olympus E-M5m2 is the followup to the popular E-M5 that kicked off the OM-D line of DSLR-like m4/3 cameras. It’s Olympus fourth stab at designing the perfect EVF-based camera. Okay, that last line needs a bit of an explanation. Olympus has taken a strange walk through the OM-D line. We started in the middle with the E-M5, got a push upwards in the E-M1, then a downgraded smaller version in the E-M10, and now are back with a revision of the middle version. One problem, though, is that there aren’t quite as many meaningful differences between the versions as you might think, especially given the price differentials. We’re still using a 16mp sensor, though not the same one as originally used by Olympus, plus we’re now on TruePic VII for the imaging ASIC. The big change at the sensor is the ability to shoot “high resolution” images with a special twist of the sensor image stabilization system. I’ll get to that more in a moment. It’s clear that Olympus spent a great deal of time tweaking virtually every aspect of the camera. But the more interesting question is where this puts the E-M5II in relationship to the E-M1. Well, modestly better than the E-M1 is many aspects except for a big one: focus. Meanwhile, going the other way, what do you give up by going for an E-M10? It seems easy enough to predict that a second version of the E-M1 will gain the things that the E-M5m2 has over it, plus probably add another new significant feature to keep it clearly apart from the E-M5m2, while the second version of an E-M10 will lag behind in features and performance as the entry model. Still, there’s less differential between the lowest and highest end OM-D camera than say, in the Canon EOS or Nikon DSLR lineups. I’m not sure why Olympus is playing in such a narrow space. I mentioned the high resolution aspect of the E-M5m2. Basically, when you set the camera into this mode it will take eight exposures in quick sequence, each offset slightly from the previous one by using the image stabilization system on the sensor to shift to create that offset. You can’t (usually) use this for subjects that move, but for subjects that are static—such as landscapes—this mode outputs a 40mp JPEG or a 64mp raw file that has two primary benefits over the 16mp files that the camera normally produces. First, because the first four exposures are moving the sensor exactly over the Bayer patten, you end up with full RGB data at each photosite position instead of just one or R, G, or B. Noise propogation is significantly reduced and edge acuity increased if we compare apples to apples (e.g. 16mp versus 16mp). We also shouldn’t get the typical Bayer-induced color moire impacts on data near the Nyquist frequency in this data set, and the color data should have better fidelity. The second set of four exposures is done with the sensor a half photosite offset, producing information “in the gaps” of the 16mp capture. Note that I put “in the gaps” in quotes, as there really aren’t any gaps. What we’re getting in the second set of data is an increase in resolution, though one that will be debated about endlessly. Note that the raw file claims to have 64mp of data. Actually, what it has is full RGB data captured at 32m locations, not 64m. The 64mp number occurs because Olympus takes the data and uses it to create a Bayer-like data set (e.g. alternating R&G on one line, then G&B on the next). If you think about it a moment, you’ll realize that the 64mp “raw” file must have 16m R, 16m B, and 32m G data values in it. This creates all kinds of additional things to think about, including the fact that the red and blue channels are down sampled in the raw file, and thus have lower noise propagation than you’d normally expect from a true 64mp Bayer sensor. In terms of how long the eight-shot sequence takes, that will depend a bit on your shutter speed, but generally it was done in a bit less than a second for the types of situations I was shooting. That has implications on landscapes where clouds, leaves, or shadows are moving, but frankly, in my testing so far I’ve found that to be ignorable as long as the movement isn’t extreme. As more than one person has suggested, if you know how the .ORI raw file is built, you can extract the first 16mp frame in it, upsize it to 64mp, then layer it in Photoshop to use in areas with motion to it. I’ll have much more to say about the high resolution results in the Performance section of this review. One of the things that is unique about Olympus is that they find ways to push the technology in interesting ways. The high resolution shooting mode isn’t the only place they do that. The E-M5m2 has keystone correction and LiveBulb shooting. The former helps correct perspective issues when you tilt up or down to take a shot (and see the actual framing that will result before you take the shot, something I’ve not see in other cameras). The latter allows you to take a bulb exposure and see the image form as it is being recorded. Essentially a real-time chimping mode for long exposure enthusiasts. Another alternative is LiveComposite, which takes a reference image then continually overlays the brighter areas on top of that, which is highly useful for some forms of light painting and may help you avoid needing a lightning trigger. These things are all on top of features that aren’t found in most other cameras (though found in some). Things like HDR capability, or the ability to customize tonal curves. In this short (for me) review, it’s impossible to go through all the technology bits that are in the E-M5m2 (and many of them I’ve addressed in the E-M1 review); suffice it to say that Olympus engineers are definitely stretching the envelope compared to some laggards in the camera industry. The tripod socket and flash hot shoe are centered on the lens axis, as they should be, something you don’t always find in small cameras like this. SD cards are accessed from a door on the right side of the camera (as you use it), and not stuffed into the battery chamber, again something you don’t always find in the small cameras. The E-M5m2 is made in Vietnam, and available in sliver/black (panda) and all black versions. Personally, the panda version is very nice looking and very classic SLR in style. It reminds me a lot of a couple of old film OMs I used to shoot with. Note: I chose to use the E-M5m2 without the optional grip for this review. One of the advantages of the E-M5m2 is its small size. I wanted to evaluate how it handled in its minimal configuration. Every time I pick up an Olympus m4/3 camera I get a headache. I suppose if I used an Olympus m4/3 camera all the time, the headache would just turn into a mild, sporadic vein throb, but terminology, density, organization, complexity, and interactions in the Olympus OM-D menu system just drive me crazy. Funny thing is, Olympus doesn’t tend to move menu items around like Nikon DSLRs do, so you’d think that I’d have more trouble with Nikon than Olympus when it comes to getting and keeping my camera set the way I want. Just isn’t the case, and the usual suspect of “accidental settings” just means you’re going to have to check and change settings from time to time even if you really didn’t want anything changed. And a note of relevance: the last few firmware updates for the OM-D models have reset all your settings. That means you aren’t necessarily done with the headache once you’ve got the camera configured the way you like it. You may have to do it again, and again, as updates come out. Tip: write everything you set down somewhere, including why you set it that way. Olympus started this messy warren of techno-mumbo-jumbo-disorganization back with the original Pen E-P1. It might have gone back further than that, but I really didn’t use the old 4/3 DSLRs much and can’t remember their menus/controls at this point more than a decade removed since my last use. What’s exceedingly frustrating is that virtually every review and every Olympus m4/3 user mentions the menu issues, yet nothing’s been done about it in six years of camera iterations. So what gave me a headache in 2009 still gives me a headache in 2015. This despite the fact that most of the controls—buttons, dials, and levers—on the OM-D cameras have been fleshed out fairly nicely and are very usable (though the 1/2 lever on my E-M1 always needs to be examined when you’ve been handling the camera roughly or take out of the bag after travel; the same lever on the E-M5m2 is better protected from accidental movement). Yeah, sure, Olympus added help to the menu system. A band-aid on a big cut that really needs stitches and plastic surgery. Likewise, the rubber eyecup design on the Olympus m4/3 cameras has been sub-optimal for six years now. If you don’t permanently tape (or glue) yours to the camera, it will be lost. Within days of heavy use. The E-M5’s eyecup is somewhat improved in this respect, as it is now symmetrical in its small plastic retainers, but it still is fairly easily dislodged. So here’s my rant: how is it that such good engineers that can make things move microns to whip up technologically advanced features no one else has not fix the obvious problems with their cameras? The reviews they read in 2009 pointed these flaws out. The reviews they read in 2010 pointed these flaws out. The reviews they read in 2011 pointed these flaws out. The reviews they read in 2012 pointed these flaws out. The reviews they read in 2013 pointed these flaws out. The reviews they read in 2014 pointed these flaws out. The reviews they’re reading right here in 2015 still point these flaws out (and I’m not alone in such reviews, by any stretch of the imagination). Let me be blunt: it’s easier to win at Pachinko than it is to get your menus and controls set perfectly on an Olympus OM-D.
It’s time for Olympus to step in and create a better way. The fact that everyone ends up using the Super Control Menu (SCM) should tell Olympus something. But SCM isn’t the solution, it’s another patch on the wound. Yes, I mention the Olympus menus and UI in every review. Some Olympus loyalists think I have some bent against Olympus because of this, though they should probably look at how I chastise Nikon for moving the cheese all the time in their menu system. I call a spade a spade. I have no loyalty to any camera maker, frankly. I believe the menu system to be an important issue for Olympus to address. They wonder why their m4/3 sales stalled. Based on the emails and conversations I’ve had with those that try the OM-D bodies thinking that they might want to switch to them from what they’ve been shooting, I can tell you one reason why those sales are stalled: the initial impression for the new-to-Olympus user is basically the same: dense, indecipherable, disorganized mess. They might like other aspects of the camera, but they immediately get put off by the menu system, MySets, the somewhat different UI, and all the terminology they encounter, which looks nothing like what they’re coming from. The don’t want to study a camera to become an expert at it, they just want to use it. SCP—which thankfully is now on by default—is not the answer to all these problems. SCP has its own issues, namely that at some point you’re going to accidentally trigger it and get something reset that you didn’t want reset. Simply put, the Olympus system appears to be designed by very smart, very clever engineers, but they forgot that to appeal to the mass market you actually need to spend more time thinking about how you present all those myriad options to the customer. Indeed, that’s one of the reasons why I rant on this: to a large degree, the OM-D models have deeper feature sets than most DSLRs. But if you need an engineering degree to figure out everything that’s going on and how to control it, you sure as heck aren’t going to get more camera sales in the mass market. I don’t use my m4/3 cameras every day. I use Nikon DSLRs every day. So I can pretty much shoot blindfolded and control my Nikon. Once every couple of months, I spend a few days or a week just shooting with my m4/3 gear. But the transition is painful, every time. When I take my m4/3 gear on an extended trip, as I did to Costa Rica late last year, by the end of the trip I’m very comfortable with it. So my complaint isn’t about “you can’t do something” with the OM-D’s or that you can’t learn the UI, it’s really about what happens to new users or more casual users who don’t shoot every day with their camera. That’s why I complain about this in a review. It’s something the potential purchaser of the product should know. And it’s something Olympus really needs to fix if it doesn’t want to stay relegated to a niche status. Okay, I mentioned some controls and other things in passing in my rant. There is good news with the E-M5m2 in that respect. The control dials are better than the original camera’s, and their burled rings are easy to find and use, even with thin gloves on. As I noted, the 1/2 lever doesn’t dislodge as easily (partly protected by the new LCD design) and the eyecup is a little steadier on the viewfinder. The Mode dial is not only stiff, but locks/unlocks easily if you’re really paranoid. The real star of the show is the swivel and pivot LCD, much like the one on the Panasonic GH4. I prefer this to the tilting LCDs, as you can swivel the LCD so that it’s face is against the camera back when transporting the camera, giving you an added level of protection for it. It’s a little resistant to getting out of the fixed position, and the notch to let you grab the LCD’s lip is pretty small. If you’ve got big fingers, you might find getting the LCD out from the body is a problem, and it’s a problem if you’re wearing gloves or the camera body is wet/slippery. Without the grip the camera is compact, and that means the right hand position is compact, too. It’s a good thing the thumb rest is so pronounced, as the front grip is fairly minimal. You can one-hand the E-M5m2 with small to medium-sized hands, but barely. The dials and shutter release are in pretty good positions and easily manipulated. What I don’t like is that we’ve lost two buttons that the thumb could easily reach on the back, and have gained buttons (now four) on the top right plate of the E-M5m2. This is a little less useful for keeping the eye at the viewfinder. I not only have a hard time finding the buttons, but I can’t really distinguish them easily. As with everything on this camera, they’re small, too. So having Fn2, Fn3, and Fn4 up in that congested top right area on a camera you’re just barely holding onto well via the built-in grips is not optimal. I prefer the E-M1’s arrangement, myself. If you need to use the Direction pad while shooting with your eye at the viewfinder, you’ll definitely need to shoot holding the camera with two hands. Of course, you should probably be doing that anyway, but still, there are times handholding a small camera like this where I’ll get stretched into a position where I’m mostly one-handing it. At least I can find the Direction pad and the OK button by touch. Unfortunately, I can’t easily find the other four buttons around it by touch, as they’re very small, rounded smooth, and two of them are embedded deeper into the back. I guess what I’m saying is this: my preferred do-everything-with-eyes-at-viewfinder style of shooting is a bit compromised with the E-M5m2. Many things I can do this way, but not everything. Overall, for a very small camera, the E-M5m2’s control handling is pretty darned good. Not perfect, but more usable than a lot of other small cameras. At least if you can get it configured properly. Battery: I wish there were good news. I got more than the 310 images the CIPA tests suggest, but not a lot more, and I was shooting a lot of bursts without doing a lot of image review. When you start using some of the more advanced features of the camera or do a lot of review, enable the WiFi or even the composite live view ability, you start chewing through batteries. And the Olympus battery charger is slow to charge an Olympus battery (and doesn’t always fully recharge third party batteries). I carry four or more batteries with me all the time with my E-M1, and I’d probably have to up that to five or more with the E-M5II. Buffer: Full out burst mode shooting RAW+JPEG (worst case) I’m getting about 15 images into the buffer before the camera slows. At the point it slows, think John Phillip Sousa march: with a state-of-the-art card you’ll get about one shot per beat from that point on, with an occasional stutter. I don’t really think of the OM-D models as burst-shooting cameras, but given that you can shoot at 10 fps with the E-M5m2, it’s nice to know that you won’t be instantly crippled, as with some cameras. Video: The E-M5m2 is no GH4. Detail is just not there, and I suspect that it’s a combination of things coupled with Olympus’ compression system. While the camera promises 72Mbps bit rate using All-I frames, it doesn’t look like it’s achieving what other cameras are getting with similar compression. Still, this is probably Olympus’ best video implementation to date. They’ve caught up to the GH2 or so. Sensor: The big question everyone wants to know about is whether the E-M5m2’s high resolution mode performs. But first, let me get the regular shooting out of the way first: when shooting at 16mp I don’t see any tangible differences between my E-M1 and the E-M5m2 or E-M1 in raw files. The small differences I could measure could very well be due to sample differences. See my E-M1 review for comments about image quality at 16mp: I’d pretty much write the same thing here. JPEGs are a little different. It seems that at low ISO values the E-M5m2 is pulling out a bit more detail than my E-M1. However, at high ISO values the E-M1 is pulling out more detail than the E-M5m2. It seems that Olympus has reversed its priorities slightly on how noise reduction is applied, as the “less detail” in both cases appears to me to be noise reduction induced. So what about the high resolution mode? Okay, first the good news: if your subject isn’t moving and you’ve got the camera well settled on an excellent support system (tripod and head), you get some remarkably good looking JPEG and raw images out of the E-M5II. Excellent edge definition, lowish noise, and an absence of color fringing and moire. Color definition can be quite good, too (though many converters still don’t handle this as well as they should). I’ve used multiple exposure many times on my Nikon DSLRs when I didn’t have access to an ND filter to get my shutter speed up long enough to blur the water, and the Olympus high-res mode produces something very similar. It’ll depend upon the speed of the water, of course, but on the Little Lehigh River I found the blur to be close to what I would have opted for using NDs to reduce shutter speed. Given the nature of the Web and JPEG images going through multiple compressions, as always read what I write more so than what you see. What I see looking at the E-M5m2 images is that in the blades of grass I see texture and detail from the E-M5m2 high-res images that I’m not seeing with the regular images. Edge acuity is slightly better, and noise is somewhat suppressed (note that you can’t shoot high-resolution at high ISO values, though). So what’s the bad news? Not exactly bad news, but if you thought that you were getting the resolution implied by a 64mp sensor (in the raw file), you aren’t. It’s a bit of a tough call, but I’d put the E-M5m2's results close to the Nikon D810’s (the D810 is a 36mp camera). The E-M5m2 will have less moire and color fringing, and for the most part a better rendering of color, but the D810 appears to still have a slight (and I mean slight) resolution edge and even a bit more edge acuity (neither camera has an AA filter). In JPEGs, surprisingly the Olympus is not quite getting the same level of detail as my D810 at default settings. I write “surprisingly” because Nikon is notorious for selecting a rather low level of sharpening in their JPEGs. Yet the Olympus high resolution JPEG seems to be slightly less sharp to my eye, and not quite resolving fine very detail as well. It could be lens-related, but I was using top optics on both cameras in this test. My guess is that Olympus’ JPEG rendering from the data set is sub-optimal. See my notes above: it’s obvious that noise reduction application is modified in an E-M5m2 from previous models. But if you get everything rock solid stable and the IS system moves with consistency, what you get is data that essentially has no aliasing and moire, coupled with very good per pixel noise characteristics for an m4/3-sized sensor. Landscape shooters will love this camera, although maybe not on windy days. Personally, I would opt for my larger, heaver tripod and ball head over the one I typically use with my E-M1 in order to eek out the best results from this mode. I also wish that Olympus had just provided us with a straight 16mp RGB capture (four-shot process). 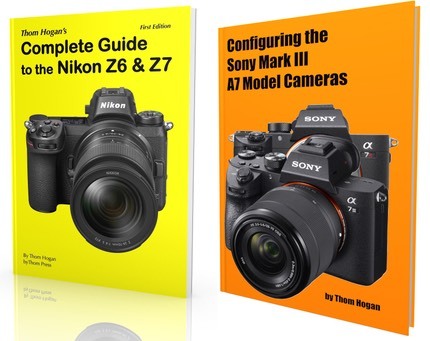 Finally, a lot of reviewers are doing as I did and comparing to a D810. Technically, there’s good reason not to do that. What you should compare the E-M5m2 high resolution mode is to a…wait for it…an E-M5 or E-M1. This makes things much simpler: yes, Virginia, the E-M5m2 is going to give you better JPEGs and raw files than those other Olympii, enough so that you’d invoke high resolution mode probably any time you could (e.g. landscapes, studio shots with non live subjects, etc.). The good news in m4/3 is that there is plenty of choice, and Olympus even gives you a reasonable amount of it in the OM-D line. Choice is good. But where I and a lot of m4/3 users get a little confused is in the distinction between an E-M1 and the E-M5m2. Yes, the E-M5 adds some new features and capabilities, but it just doesn’t quite have the same focus performance as the E-M1, particularly with tracking subjects and certainly using the old 4/3 lenses. This puts you into a bit of a bind if you’re a one-camera person. You give up something different depending upon which of the two you select. And one can fully imagine a year down the line when an E-M1II (hmm, that doesn’t look right ;~) comes out and picks up the E-M5m2 additions and adds a new wrinkle or two of its own. This “leap frog” thing Olympus is doing with the two models makes picking the right one temporary, at best. I suppose they just want you to upgrade faster (or keeping buying the newer body and use your older one as a backup). All else comes out more equally between the two cameras, though the E-M5II is a bit smaller than the E-M1 and handles more like a small camera without the additional grip than the E-M1. My problem is that I go both ways. I want my m4/3 kit to be ready for wildlife and landscapes. Thus, neither camera is perfect and I have to pick a compromise if I’m only going to keep one. Let’s hope that the next E-M1 adapts the high-resolution mode, as it’ll make my life simpler. With Olympus recent more aggressive pricing, the E-M5m2 definitely should give one pause before picking up a Canon or Nikon prosumer DSLR. A few of you will decide the Olympus is the better choice for you. I’ll bet that most of you who do are more on the static subject side of things, though. 2018: this model is still available.